Increased demand for greater data transfer speeds and more bandwidth over shared networks, plus the need for HD video editing support on high-performance shared storage systems has driven the explosion in demand for 10 Gigabit Ethernet (10GbE) networking—offering ten times the performance of Gigabit Ethernet, the most common wired network connection today. It’s no wonder. And yet, most computers aren’t equipped to get you connected. 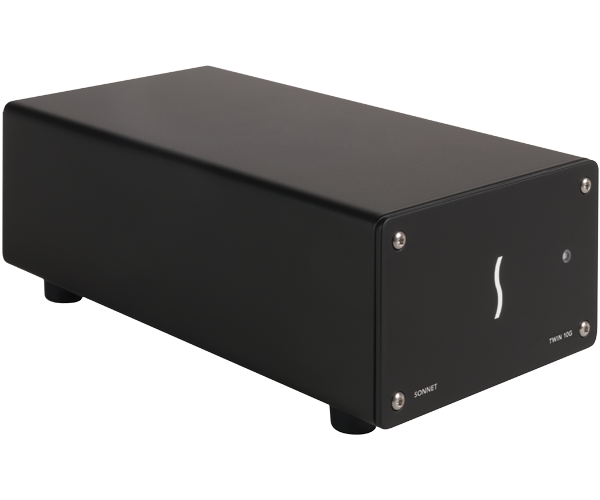 If your computer has a Thunderbolt 3 port, you are in luck—Sonnet’s Twin 10G™ Thunderbolt 3 Edition dual-port 10 Gigabit Ethernet adapter is the powerfully simple and cost effective solution for adding blazing-fast 10GBASE-T 10GbE network connectivity to any Mac® or Windows® computer with Thunderbolt 3 (USB-C) ports.